The Redpark DEX cable enables route drivers to connect their iPad or iPhone to vending machines or grocery store systems for direct store delivery (DSD) accounting and inventory management. Redpark Product Development—Emeryville, CA—announced today that it is now shipping the industry’s first DEX Cable for iPhone and iPad. The Redpark DEX Cable is used by route drivers in the grocery and vending machine industries. It provides a way to connect iPhone and iPad to a vending machine or to a grocery store’s computer system for direct store delivery (DSD). 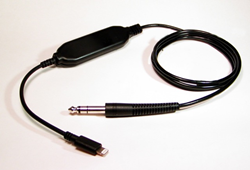 The DEX Cable (part# L2-DEX) has an MSRP of $79 and is available today. Redpark Product Development engineers enterprise accessories for iPhone and iPad.